Duck Donuts (3630 W. 95th St., Leawood, Kansas) has arrived in the Kansas City area. The North Carolina-based donut shop is a concept centered on customization. Your job is to figure out how to top a vanilla cake donut. The donuts are served warm, which means they’re best eaten onsite, although the carry-out boxes come with venting flaps to keep the donuts from getting soggy. 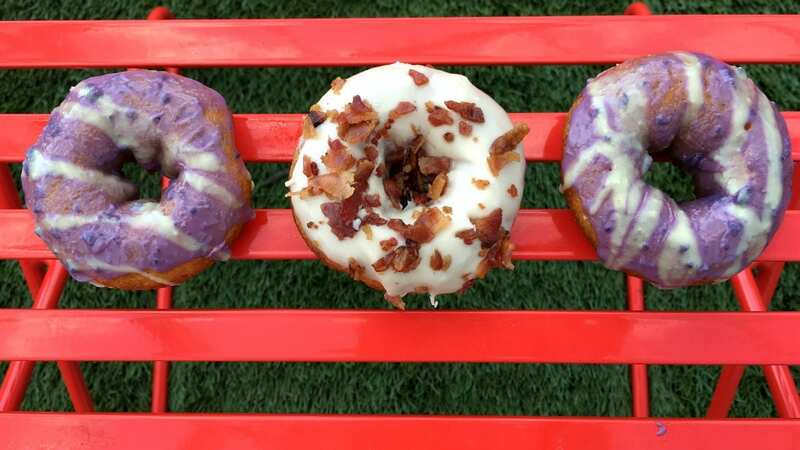 Duck Donuts (so named for the town of Duck, North Carolina, where the idea was born) also has signature flavors (maple icing with bacon, blueberry icing with lemon drizzle), donut breakfast sandwiches, or ice cream sundaes made with Breyers’ ice cream. Duck Donuts is open from 6:30 a.m. to 7 p.m. Wednesday through Sunday, and 6:30 a.m. to 3 p.m. Monday and Tuesday. Seafood takes center stage in Lee’s Summit with the Pearl Tavern (1672 NW Chipman Road, Lee’s Summit, Missouri), which opened this week in SummitWoods Crossing. Pearl Tavern is the latest concept from Andy Lock and Domhnall Molloy, who also own and operate Boru Ramen Bar, Lakewood Local, Third Street Social and Summit Grill. The menu revolves around fish and shellfish with pretzel-crusted trout, a shrimp and crab boil and blue crab dip. Executive chef Kent Long is a former executive chef with McCormick & Schmick’s, where Lock and Molloy also worked. happy hour, with $1 oysters, is from 3 to 6 p.m.
Café Sebastienne (4420 Warwick Blvd.) has a new executive chef. Rick Mullins, who was the chef du cuisine at Gram & Dun on the Plaza, is now leading the kitchen at the restaurant inside the Kemper Museum of Art. Mullins is reunited with general manager Mickey Priolo. The two chefs run Soil Collective, an initiative that blends storytelling, local foraging and pop-up dinners. Pro tip: wines are half-off between 5:30 and 9 p.m. on Thursday evenings this summer. France is headed to the World Cup final, and Café Provence (3936 W. 69th Terrace, Prairie Village, Kansas) is celebrating Bastille Day from 5:30 to 9 p.m. Saturday with live music. It’s serving the regular dinner menu and your order should include the steak tartare. Café des Amis (112 1/2 Main St., Parkville, Missouri) is honoring the holiday with a prix fixe dinner ($35, reservations required) on Sunday from 5 to 9 p.m. Celebrate with mussels, pan-seared sole with orange sauce, and chocolate mousse. I have a few beer odds and ends for you [to get further inspiration, check out our #Taplist column below]. Torn Label Brewing Co. (1708 Campbell St.) is launching a Friday infusion series in its taproom this Friday. They’re tapping Sim-peche-tico at 4 p.m. It’s their Simpatico IPA with peaches. Limitless Brewing (9765 Widmer, Lenexa, Kansas) is hosting a painting party from 9 a.m. to noon Saturday. Help get the brewery-in-progress going, and they’ll give you lunch. Things are apt to get a bit corny in Leavenworth this weekend. Salt Creek Valley Farms (17842 Santa Fe Trail, Leavenworth, Kansas) is hosting a Sweet Corn Festival from 10:30 a.m. to 5 p.m. Saturday. The festival ($20 per carload admission in advance, $25 at the gate), is family-friendly with a corn eating contest, hay rides, plenty of corn to pick or eat and a beer tent. Learning to cook? You don’t have to do it alone. The Mid-Continent Public Library hosts “Cooking With Real Food,” from 2 to 3 p.m. Saturday at its Blue Springs North branch (850 NW Hunter Drive, Blue Springs, Missouri). Jennifer Backlund will lead the free class that covers kitchen gear, herbs and spices and healthy cooking. Registration is required to attend the class. Sunday is National Ice Cream Day. Betty Rae’s (7144 Wornall Road) is celebrating from 11 a.m. to 9 p.m. Cheesy Street, a grilled cheese food truck, and KC Pinoy, will roll up after 3 p.m. Cinder Block Brewery (110 E. 18th Ave., North Kansas City, Missouri) is putting its own spin on the national holiday by offering beer floats. Betty Rae’s will be providing the ice cream, and Cinder Block will be scooping it into beer and cider between noon and 5 p.m.